Figureheads from great ships may catch our fancy, but a head for figures (and relevant artifacts) shall be recognized here this month. Punch keys and levers and revolving numerical wheels may seem far removed from salt-laden breezes and creaking rigging, but the hard realities of financing large wooden ships could sink a vessel as effectively as a hard submerged ledge. 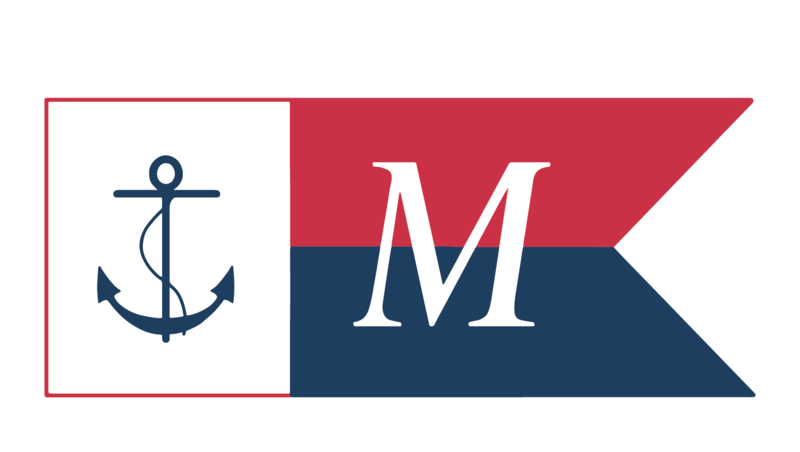 Behind every schooner there was a shipyard; behind every shipyard there was an office; behind a desk in that office was somebody keeping track of the numbers: cost of materials, investors' shares, payroll, insurance, customs duty, etc. And on that desk were heavy mechanisms with moving parts that assisted this accounting. Our collection boasts several of these early 20th century mechanical calculating devices, most still faithfully crunching and clacking away at the pull of lever or twist of the crank. 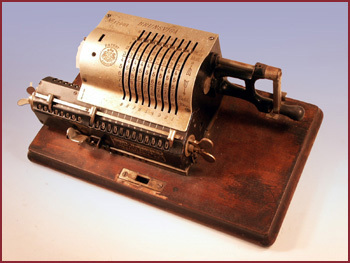 Purchasing the patent rights from Swedish inventor Willgodt Odhner in 1892, the German Brunsviga Company produced numerous variations of this pinwheel calculator, which were exported widely until 1912. 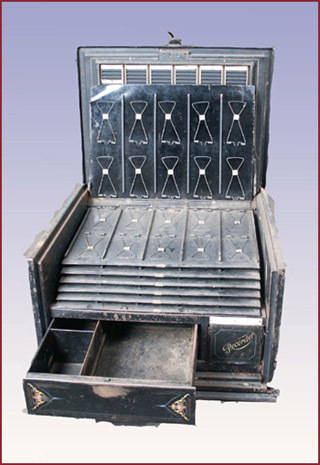 So called because the 1887 prototype was installed in a shoebox, Comptometers remained in use well into the 1970's, as they were actually faster to use, in experienced hands, than even subsequent electronic calculators. Its keyboard system allowed the rapid use of the fingers of both hands, and the company ran schools for workers to learn this technique. 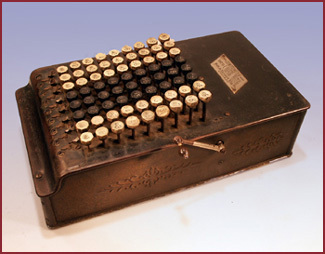 The smaller digits on the keys (below) were for a subtraction procedure. 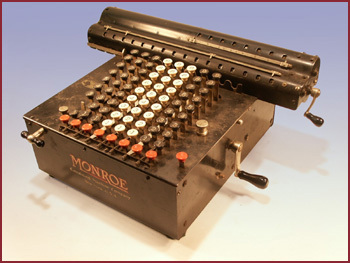 One of the first commercial models manufactured by the Monroe Calculating Machine Co., Orange N.J., the actual rotary cylinder mechanism has its origins in the 1870's with American inventor Frank Stephen Baldwin's patent. Monroe is still in business today as Monroe Systems for Business, Levittown, PA., and has left their hand crank far behind. 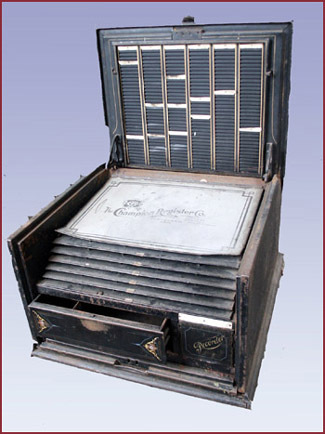 Though not exactly a calculating device, this extremely heavy (100lb.+) credit register, built by the Champion Register Co., Cleveland, Ohio, would be of benefit to a shipyard paymaster with numerous cash payrolls to manage. 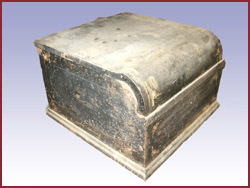 The clamshell lid retracts to reveal a self-contained "business system" wherein individuals' wages, either cash or credit chits could be pre-distributed, and kept organized and secure. May all your sums stay in the black.